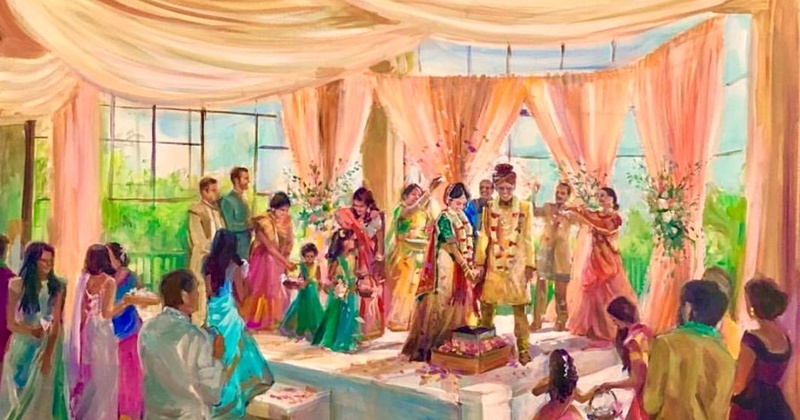 Live Painting is the New Indian Wedding Trend you're going to fall in love with! Trust me — after your wedding photos and video, these paintings are going to be the next most-treasured memory of your wedding. Don’t believe me? Well, think about it - I know there are a lot of ways to capture your wedding memories. There’s photography, videography, obviously photo booths, GoPros, drones, live-streaming, but how about taking it to the first ever way to ever preserve a memory - paintings? Believe it or not, now you can hire trained artists across the country who specialize in painting live events. And what better than your own wedding? Cool right? I say go ahead and book one amazeball painter for yourself already. Because if you are on the lookout to have a one-of-a-kind and trend-setting wedding, I say you go big on this new Live Painting trend!